The ‘Golden Triangle of Logistics’ is a key buzz phrase, which most people within the industry will be aware of. 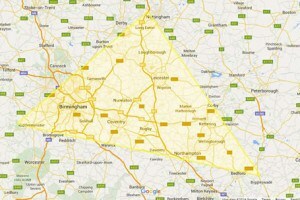 The term refers to the Midlands, which is the prime location for UK distribution and warehousing. This area incorporates Northamptonshire, Warwickshire and Leicestershire, and includes parts of Derbyshire and Staffordshire. Many leading brands operate from this location, both for their warehousing and distribution services across the UK. Why choose the Golden Triangle of Logistics? When it comes to distribution and warehousing, location is everything. Often deliveries are timed, therefore it is paramount to reach your customers on time. Operating from the Midlands in the centre of the UK provides the optimum location to deliver the best service to customers. This prime location has many benefits, including access to 95% of the British population, which is perfect for same and next day deliveries. Multiple brands have made the strategic move to this location, sighting competitive advantage as a key decision factor. European distribution companies are also aware of the benefits of this location, with the ease of delivering to this central area in the UK. The NX Group offer the opportunity for European companies to deliver into one location, with NX providing the onward distribution of goods across the UK. DIRFT is located at Junction 18 of the M1, with links to all the major road networks including the M6, A5 and A14, and quick access to London and Birmingham. This logistics centre is home to both the large players within the market, and also smaller independent companies. The four big supermarkets have operations here, with access to their stores situated across the country, along with using their other distribution centres across the UK. 2017 will see the site expand by 7.86 million sq ft (source: DIRFT), increasing the number of warehouses and distribution operations. This is an encouraging market trend – highlighting growth across the logistics and warehousing industry. There has been an increase in the level of UK manufacturing and distribution, as well as imported goods coming into one central UK hub before being distributed across the UK. In line with this trend, the NX Group has continued to grow and develop across each area of the business. The NX Group operates from the prime location of the Golden Triangle, with multiple benefits, which are passed on to customers by providing the complete supply chain solution. The NX Group have been operating from this location for over 7 years, and in that time have gone from strength to strength, whilst ensuring that customers remain as the key focus. Contact the team to find out more about what solutions the Golden Triangle of Logistics and NX can provide for you.